There are many reasons why I am proud of my 3-year-old son Philip. One of them is how he shares my love for contraption games. I loved playing The Incredible Machine game franchise when I was still in junior high and now, I am glad that Philip has taken a liking to newer games like Bad Piggies. 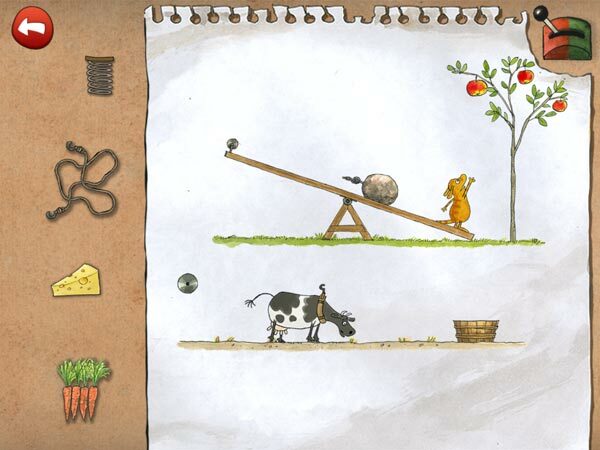 Today, I will share with you another intriguing contraption game for the iOS platform, entitled Pettson's Inventions. In Pettson's Inventions, you arrange components to build strange and complex contraptions. Pettson's Inventions is a fun contraption game by Swedish developersFilimundus, which stars Pettson, a man who loves inventing new contraptions to accomplish various goals. In the game, you will find 25 quirky inventions (unlocked one at a time) as well as two bonus ones that you can play anytime. The game is divided into levels, in which you design your contraption by dragging various components from the palette on the left hand side to the positions that you want. When you are satisfied with your design, you can pull the lever on the top right corner of the screen to test how your contraption would run. You can replay a design for as many times as you like until you achieve the level's objective. For each level, there is only a single correct solution. It is interesting to note that in addition to the components commonly found in any contraption game such as gears and belts, Pettson's Inventions adds many unique ones that include animals and other creatures. In the game, it is not uncommon to find cows; a funky, wind-producing blue creature; cats and mice; old men and women; and mills operated by wind and water. The gameplay in Pettson's Inventions is fairly simple. You don't need to flip, rotate nor resize components to fit in the solution -- you just need to drag them and they will snap into place as long as you found their correct position. The only problem is that you do not get any hints, at all. Fortunately, though, this game has an excellent learning curve through its level designs. Even though there is no tutorial, the first few levels are easy enough for you to solve on your own. These introductory levels also introduce you to the various components that you would use in the more complex levels. Pettson's Inventions is shipped with a default difficulty level set to include fake objects so that figuring out the contraption design is a bit harder. Depending on the levels, the game will include 2-3 additional components that you won't need to include in the contraption. If you feel that the game is already too difficult with the absence of hints, you can turn off these fake objects in the in-game Settings menu. Depending on how old and mature your juniors are, some levels may be too difficult to solve on their own. It might be a good idea for you to play along so that you can help them whenever they are stuck. But based on my personal experience, the game is not too difficult -- I was able to solve all 27 levels in less than two hours. The contraption is composed of various and often strange objects. I really like the way the game levels are designed. The introductory levels are excellent for introducing new players to the game. Plus, I also like how the game quietly connects all the levels to create a surprising twist in the final level. Every time you complete a level, the game leaves you with small gears. At first, I thought that the game should have given me a better reward. I was also annoyed at how the game left the gears cluttering up the main menu. It was only after I accidentally found out that I could tilt my iPad and the gears would slide around the screen that I started to wonder if the gears were going to be useful later on. And it turned out I was right -- you will need them to solve the final level. Finally, I also really like the two bonus inventions that are included in the game. I especially enjoy building the soapbox car from scratch. Philip also loves it -- it's the one level that he keeps replaying. The bonus levels are playable anytime. In one of them, you can build a soapbox racer from scratch. Since the game does not provide hints, you may find yourself stuck in a level without any chance to move forward. You also can not skip a level, so it would be frustrating if you do not know how to solve a level. In this section, I will try to give you some general playing tips that might be able to help when you get stuck. But, I won't give you an explicit walkthrough for solving each level because that would reduce the excitement of playing. Cows love carrots and will try to move forward to reach them. You can use their energy and motivation to move something else along. The funky blue creature stores a good amount of wind. By setting up a 1 kg weight to fall on him, he would blow a gust of wind that you may use to turn on a windmill. The game always keeps the windmill and its sails apart. Hence, it is always a good idea to attach them back together. If you see a barrel, it typically holds a good amount of water. You may need to set up a water pump to get the water out and into the pipes. You will need conveyor belts to connect distant (non-adjacent) gears. Sometimes, you also need these belts to connect the windmill and the water pump to other things. If you see a white square window with shades, you can be sure that it will open up to reveal a monster. You can use this monster to scare nearby animals to move in the opposite direction away from the monster. In addition to windmills, you can also find a water wheel. It takes the form of a gear and requires a flowing water from pipes or water faucets to trigger its movement. If you're trying to repeat an action, typically a vertical movement, you might need a spring. One final tip: if you are playing with a lot of gears, pay attention to the color of the inner circle of those gears. You can match this with the color of the dots in the contraption that would hold the gear. This will prove useful to solve the final level that uses a gazillion of gears to complete. In the final level, you must place multiple gears collected from previous levels to help launch Pettson's pet into space. Pettson's Inventions is a really cool contraption game that helps your juniors practice their creative skills. After you play alongside them through the first few levels, they should be familiar enough with how each component works and you can leave them alone to solve the other levels. Finally, if you enjoyed the game and are looking for more contraptions to play with, you might want to consider getting Pettson's Inventions 2 also. The sequel includes 37 new inventions with challenges that will take more real estate than just one screen size.